At our next meeting, we'll be focusing on: Needles & Threads! Discussion: What kind of threads and needles do you use and why? We all have lots to learn about the benefits and drawbacks of using different types of threads and needles on different machines and during different parts of the quilting process. We'll pool our collective knowledge to come up with some answers and tips! Demo: Kathryn will demonstrate how to bury your threads when quilting. WIP Switch Challenge: Shake up your inspiration a little! Bring one of your WIPs (works in progress) that you've lost momentum on, and swap it with another member's WIP. You'll finish someone else's WIP and gift it back to them, and you'll get yours back as a finished quilt, too. Show & Tell: Bring something finished or in progress to share with the group. Be ready to share your thoughts on what makes it modern. See you on Saturday, February 8th at 2pm at Ryco Creative Sewing Center. Thanks to everyone who came out to our January meeting! Becky made a wholecloth quilt inspired by the RIMQG's logo! Next, we brainstormed some awesome ideas of challenges, demos, workshops, and activities we want to take on in 2014. 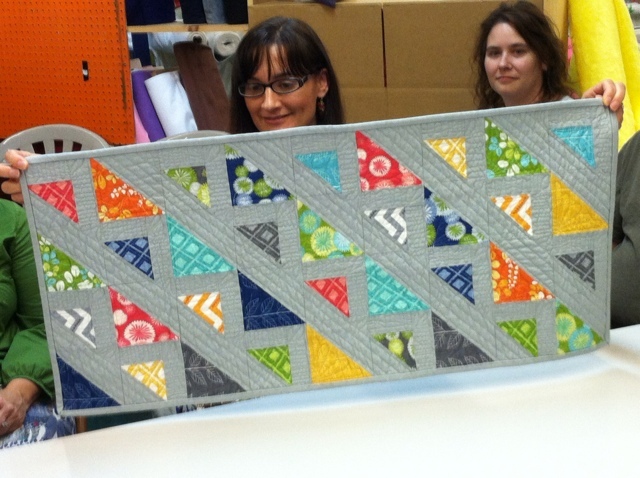 Thanks again, everyone, for sharing your beautiful quilts and inspiration with the group! 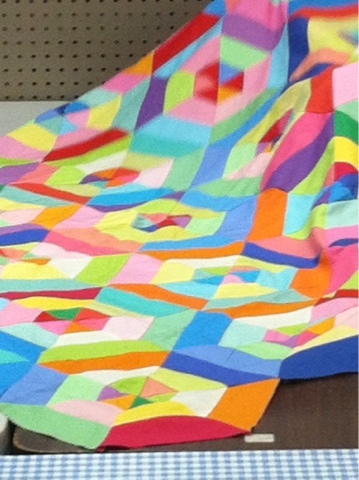 2) There is a Free-Motion quilting challenge due in January. 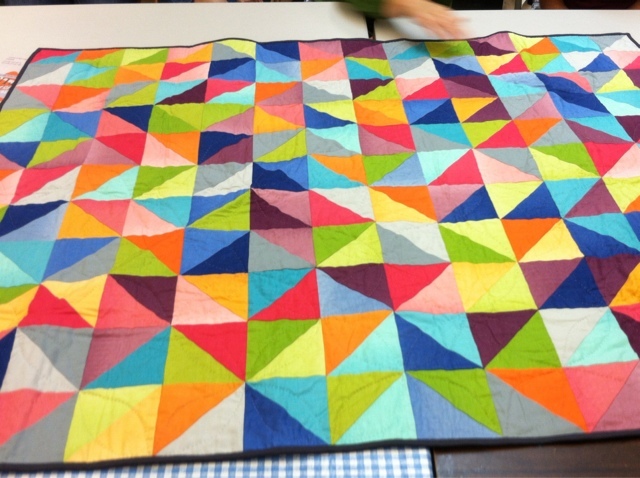 The parameters are to create a whole-cloth quilt (or table runner, wall hanging, etc.) and get creative with your free-motion quilting. 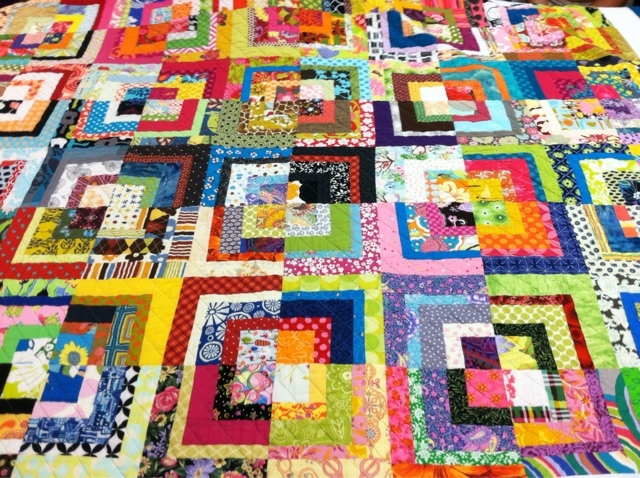 Whole-cloth means the quilt will have no patchwork; we suggest using a solid fabric or a subtle print that will allow your quilting to be the star of the show. If you need some inspiration or have questions, take it to our Facebook page and get feedback from the group. 3) To prepare for the challenge due in January, we are practicing by bringing a 10x10 mini quilt sandwich to the December meeting (no binding necessary) with a free-motion design that gets you out of your comfort zone. Try something new! See the photos from the demonstration for reference. Our goal is to toss all of the mini's on the table at the next meeting and see what the group came up with. The mini's will be collected and we will make a booklet of sorts, from which we can refer to if we need quilting design inspiration. Bring as many as you'd like! 6) And last but not least; show and tell! Thanks to everyone who made it out to the meeting! membership forms that will be submitted before the end of the year. Keep on quilting and see you next month! We will have a busy meeting, so plan for a bit more than the usual hour! See you November 9th at Ryco! We had another great meeting this month filled with inspiration and goals for the coming months. We shared our "make it modern" challenge items, as well as other show-and-tell pieces. We issued a new challenge for our November meeting. As we continue to explore our goal of "designing your own quilts", our challenge is to bring an item that you designed yourself. We will dive into this during our October meeting with a "3x3" (three individuals who talk for 3 minutes each) about their design process. A new quilt shop called Knit One Quilt Too is opening in Barrington on September 24th. For longarm resources - our members Sue, Alison, and Pat all offer longarm services, or check out Mad About Quilts in Mansfield where you can rent a longarm machine for your own use. 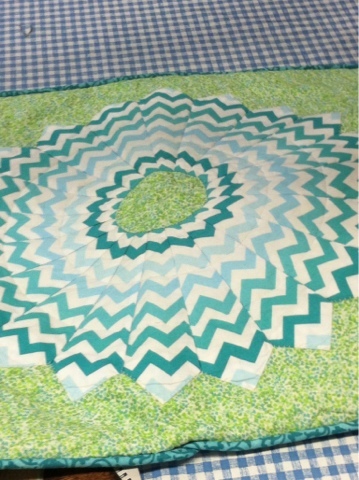 Craftsy is a great resources for online quilting classes. Ningret Quilters has an upcoming show from October 18-20 in Westerly. Feel free to post any additional resources to our Facebook page! Show & Tell: Bring something in-progress or finished to share with the group. Make it Modern Challenge: Our challenge for this meeting is to take something that's usually "traditional" in quilting and make it "modern" - whatever that may mean to you. Bring your project and we'll continue our exploration of what defines Modern Quilting. Improv Quilting Demo: Coco will demonstrate the process of improv quilting, or quilting without a set pattern/plan in mind. As always, we'll be at Ryco Creating Sewing Center. Thanks to everyone who came out to our meeting this weekend! 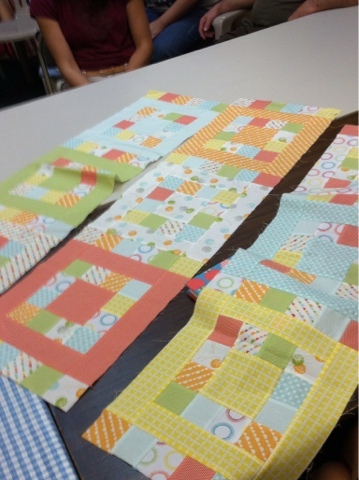 We had a great group and a lively discussion of what makes a quilt modern or traditional. Below is the list we came up with. The MOST important thing to remember is that our guild does not see modern as "good" and traditional as "bad" - we don't exclude anyone from our group for being "too traditional." What we all have in common is that we're all interested in exploring the modern aesthetic. So much of our inspiration comes from tradition techniques and patterns! This list is the basis for our next challenge: MAKE IT MODERN. For our next meeting, we're challenging our members to take inspiration from traditional quilting and update it to make it modern. Becky brought a great example of this to our meeting this weekend: she updated a traditional dresden block by using bright chevron fabric, and by using all the same fabric around the plate. Here are some more photos from our meeting (blame my dead camera battery for the low-quality photos - I had to use my iphone. Still, these modern colors really pop!). Our next meeting will be on Saturday, September 7th at 2pm. 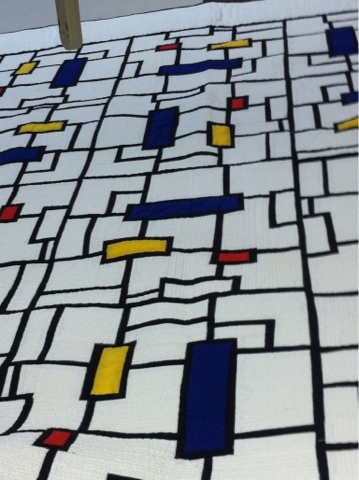 We'll continue our exploration of what makes a quilt "modern" by sharing the results of our "Make It Modern" challenge. Then we'll have a demo by Coco on improv quilting. Don't forget to bring something to share at show & tell. As always, we'll be at Ryco Creating Sewing Center. See you there!! During our April meeting we heard a great talk on COLOR from Allison Wilbur. Allison discussed Primary Colors, and the bold effect of Complementary Colors (color wheel opposites). Allison suggested using a color tool like the one below (or even paint chips!) when shopping for fabrics. Allison also showed us the effect of warm colors versus cool colors. In the star blocks below, when the warm color is in the background (yellow/orange fabrics), the block tends to appear "flat", but when she reversed the pattern and used the warm colors in front, the star really develops depth and a 3D effect. The blue quilt below demonstrates the use of monochromatic fabrics, and the multi-colored quilt has an interesting effect of fading from one color to another. 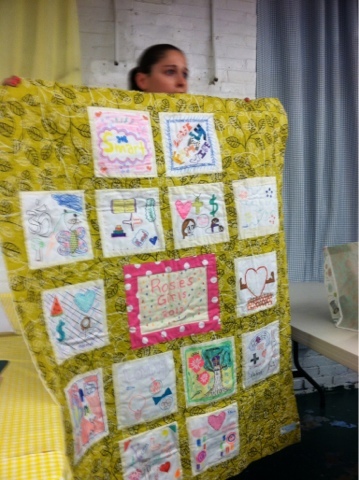 As always, we saw some amazing quilts from our members during "show and tell"! Thanks to everyone who made it out to the April meeting. We are all looking forward to seeing the finished items from our Crayon Challenge at our May 4th, 2pm meeting! More details about our next meeting will be posted soon. Allison Wilbur will be telling the group about Color. Members are encouraged to bring examples of work where they believe they effectively used color, or where they could use some advice. Learn about Allison's initiative with Quilt for Change, where she uses "the Art of Quilt to Inspire Social Change". We are still working on our Crayon Challenge! This challenge was assigned at our March meeting where members blindly picked a crayon out of a bag, and had to use that color as the inspiration for their next project. We will be presenting our finished items at our May meeting. If you would still like to participate in the Crayon Challenge, we will provide another opportunity at our meeting this Saturday. Show & tell - Bring a finished piece or a work in progress! Get some helpful insight from the group on where to go next with a project, or even how to better bring out your inspiration color from the Crayon Challenge. Don't forget your Polaroid Block name tag! As always, we meet at at Ryco Creative Sewing Center.